The Parameters Panel is in many ways the heart of the Synfig interface. This is where all the parameters of the layers you create are edited, and in some less obvious ways. The layout of the Parameters Panel is quite simple - it is a table. The first column, named "Name", is simply an expandable tree listing of the parameters of the selected layer. Most layers do not have many nested parameters, with the exception of the Vertex List on most Geometry layers. The second column, "Value", is where the data for each of the parameters are listed. Several different types of data can be shown here. The third column, "Type", show the data type. It is possible to fix interpolation by parameter. Right-click any parameter and choose its default interpolation from a submenu. 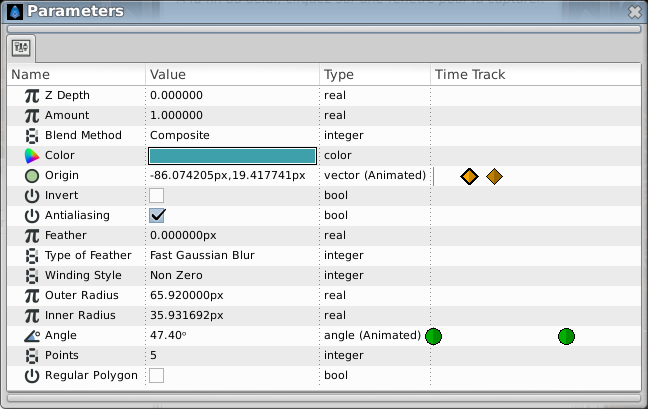 The defined interpolation is indicated in the Parameters Panel with corresponding icon near the parameter value. This page was last modified on 3 February 2014, at 12:36.